Edge Banding – Melamine, Veneers & PVC Edgebanding. Our edge banding service has been developed over many years, to exactly match the requirements of our trade customers throughout the UK. We use the latest edgebanding equipment and offer the widest choice of materials to deliver a top quality finish and faster turnaround times. Avon Plywwod are known as edge banding specialists, the process starts by providing customers a massive selection of wood based sheet products, which are cut to size on our Holzma beam saws. The material is then passed to our edgebanding team who use our EBM KDP 118 SLK edge banding machine, with diamond pre-milling, to apply the selected melamine, wood veneer, wood coil or PVC edging. Following the application of hot melt glue, the edgebanding is applied to the board. End trimming and / or top and bottom trimming is then carried out with straight or radius edges as required. An additional profile scraper is used to ensure a fine finish on PVC edging, followed by a flat top and bottom glue scraper. Finally, twin cloth buffing wheels give a polished finish. Perfect Edges : We allow for Diamond Pre-milling on the EBM Hot Melt Edge Bander, which gives a perfectly finished vertical edge. Edge Profile : With the thicker lipping materials (2mm or 3mm) it is possible to machine a small radius on top, bottom and corners as well as square edge. By default the thin edging is trimmed with a 15-degree finish. Choice of edge material : Choose from 0.4mm Melamine, 0.6mm or 3mm Real Wood Veneer edgebanding. 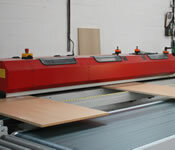 For PVC we use 1mm, 2mm and 3mm thickness edge materials. Accurate Information : Our computer based optimising program will calculate trim factors for the selected edge banding material.